I haven't had much chance to get back to the blog in the last two weeks. After I posted the wrap-up article for Enter The Danny, I spent the rest of the week scrambling to get stuff for the examiners who were at the bank, and that's where my mind was. This week I've been on vacation, which has been awesome, and which has also had me on the road away from my computer. I'll have some more about all of that in a day or two. Although I've still got the weekend ahead of me, today was my last day of vacation. *Sigh...* Like my sister, I am really good at being on vacation. After I dropped off Jack and Ava, Blake and I had some breakfast at Burrito Tower, hit the gym for a while, and then went swimming after lunch. Most of my swimming trips this summer have been far from relaxing, since I've usually got all three kids with me, and Courtney is asleep after working the night before. Since there is no shallow end, this means that I spend the whole time in the pool holding on to Jack (who wants nothing more than to escape my grasp) and Ava (who wants nothing more than to wrap her arms and legs as tightly as possible around me the second water touches her body). Today, though, was my chance to kick back by the side of the pool with a magazine and soak up some sunshine, jumping in sometimes to play with Blake. I've complimented Blake on these pages before for his advanced mojo, and I got another glimpse of it today. When it was time to go, I motioned to Blake; he dried off, put on his shoes and shirt, and then told me he had to do one more thing before we left. There were some white wildflowers growing at the base of the fence behind our chairs. 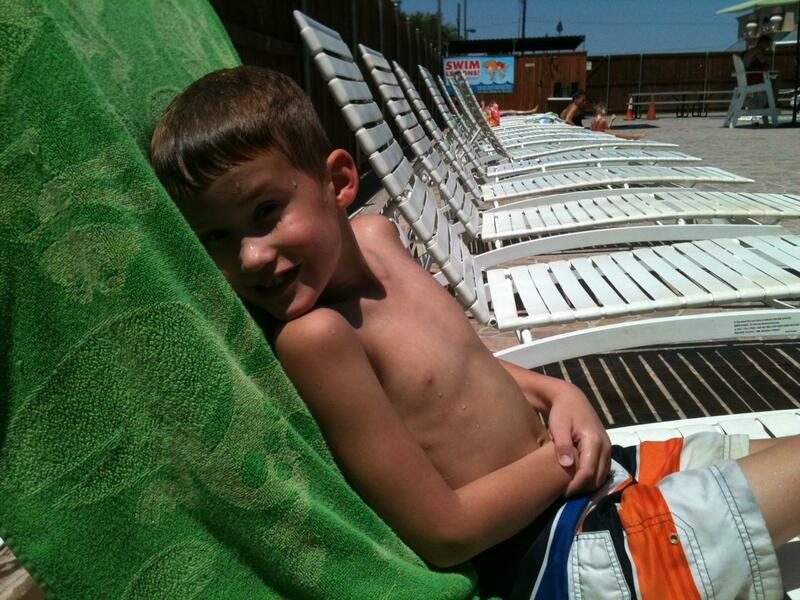 He plucked one of them, stood up, and walked to the other end of the pool, where he reached up to the lifeguard sitting in her chair and handed her the flower. From where I sat, I could only see all of this, not hear it, so of course I had to ask him how it went as we were walking out. "I told her that I picked a flower for her, and I think her ponytail is pretty." "Nice. What did she say?" "She said, 'Thank you! That's really sweet!' Do girls really like getting flowers?" "Yeah, they do. That was a smooth move, son." "Daddy, no! I just wanted to do something nice for her." I looked back over my shoulder to see her smiling and holding the flower up to show to the lifeguard on the other side of the pool. Both of them had their eyes on Blake as we left. "Well, I think you did something very nice. I think you made her very happy. And you're right, her ponytail is pretty." I'll have to show him The Sandlot sometime soon. The best "moves" are the ones that are genuine. Maybe Blake has just learned caring and giving from a great mom (fine, maybe dad too).